Is It Getting Time to Purchase a Home? HomeBusinessIs It Getting Time to Purchase a Home? Given the recent experience in housing is real estate an asset that should be abandoned? Obviously not but that mentality has grown dramatically within many segments of our nation. Can you blame people for never wanting to venture back into the real estate market? No. It is understandable but it is not the real estate’s fault. The fact is very regrettably far too many people did not fully understand and appreciate the dynamics at work in the real estate market nor did they appreciate the risks involved in the mortgage finance space. I empathise. That said, real estate ownership should not be abandoned. Let’s take a glance below at a graph of New Home Sales over the last fifty years. Throughout the ’60s,’70s and ’80s, we can see significant support and resistance levels for New Home Sales between 400k and 800k per month. 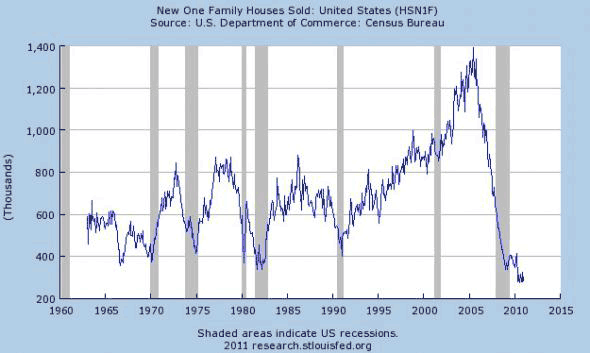 As this graph highlights, New Home Sales have clearly CRASHED over the last few years. The February reading of 250,000 was the lowest in many moons. Thus the question begs, is it time to buy? While this thought process may be understandable it is this type of thinking which is a strong indication to me that real estate is likely approaching a time to buy. That said, while some may want to speculate in real estate for a quick flip, I do not think we will see a sharp bounce in real estate. I envision a likely continued gradual mild erosion in prices after the crash that has occurred. From there, we will likely experience a market with flat to mild upticks in prices for a number of years as the excess housing supply is absorbed. A leg down from current levels as forecasted by many would seem to me to be a good point of entry for buyers who are well positioned to make a solid down payment and live well within their means and ability of making monthly payments. Never buy a home? Would you rather purchase equities at current levels? Not me.